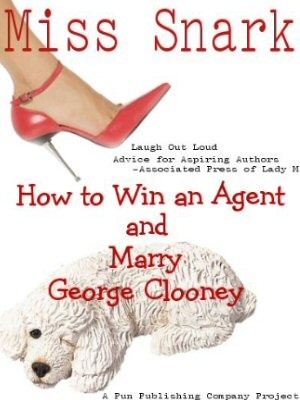 Miss Snark, the literary agent: When Are You Going to Write A "Real" Book?-UPDATED!! When Are You Going to Write A "Real" Book?-UPDATED!! A misguided friend recently asked me when I'm going to write a "real" book (aka literary fiction). I responded with an attack on his personal life, and I believe that ended our friendship. I'm not terribly upset over the loss, needless to say. I expect this question to come up again, as my social circle includes some rather pretentious artists and intellectuals. The worst of them provide the best comic fodder, so I don't wish to excise them from my life. I'd like to be prepared with a classier come-back, something snarky but proper. Do you have any suggestions? 1. I'd love to write literary fiction but my agent flat out refuses to stop making money on my work. 3. I leave the pretentious naval gazing to people better trained for the job. 4. I'm purposely avoiding writing anything that will be of interest to you. 5. How kind of you to show an interest in my career. Are you asking because you need a loan? 6. I'm reserving the great novel for when I need to lower my taxable income. 7. Literary fiction tends to be attractive to people I don't much care to be around. 9. Yanno, that's exactly what someone asked Stephen King three days before he received the National Book Award for outstanding contribution to American letters. 10. Right about the time you get your head out of your analogous. 11. Did you drop out of charm school or were you just asked to leave quietly? OMG! I'm printing this out and laminating it to carry in my wallet. Thank you, Miss Snark! Excellent question and excellent answer. Thanks to you both, I'm now armed. Miss Snark, you rock! I think #5 is my favorite. Perfect! You could really insert anything in place of "literary fiction," too. I hope the people over at SCBWI are reading this blog, because we (children's book writers)hear this question all the time. Some of these responses will work for us, too. And they'll certainly get us started thinking up our own. Heh. I wonder if there's a genre in which one doesn't get asked this question. Can I post this on my blog, MS? With proper attribution, of course, and a link to your blog. Loved the comebacks. All excellent comebacks (as you'd expect) but for some reason I find responding with an attack on their personal life equally amusing. Nothing quite like a bit of over the top kneejerk hysteria. Love to have seen it. My hands-down favorite is number four. As for number three, I hear naval gazing is quite something, especially when the ships are in port. I love this one: How kind of you to show an interest in my career. Are you asking because you need a loan? ...the kind of snark that sneaks in for the kill! 11 I have two words for you. "James Joyce". 12 I like to write books that people actually read. My personal faves are #4 and #7. Thank you so much. I went to college hoping to gain the insight needed to get a decent career started. The best my "professor" had to offer was that I'd be a great writer, if I'd stop writing genre fiction. Well poo on that! I write what I love and I'll stop writing completely before I write something just because it's what's popular. "When they stop paying me for writing fake ones..."
Oh, Bibliofile B., ROTFLMAO over your answer 13. It's succinct, inquisitive, and it sort of gets to the essence of the exchange. I plan to memorize those comebacks and fire one of them into the ear of the next pretentious, mouthy, literary elitist. I write genre fiction, and to be honest, I'm tired of being treated like the red-haired stepchild. The subject matter may scare the weak-kneed or timid away, but genre fiction isn't any easier to write. One of the most amusing aspects of the Kaavya Viswanathan scandal was that she was heralded as a coming literary genius. Then, it turned out that she was plagiarizing from unashamedly commercial chick lit. Has anyone heard Megan McCafferty’s books described as literary fiction? On the other hand Shakespeare was considered in his time to be low-brow. Spenser’s “Faerie Queene”—now that was literary! My favorite is #1. It reminds me of Liberace's "I'm crying all the way to the bank." I'd probably answer, "I'm writing what I want to write. If you want something different, write it yourself." But that doesn't have any zing to it. RMAOLOL!! I've heard this question over and over again, and will add your replies to my standard, "Are you trying to be rude, or is it a condition that just come naturally to you?" Next to "I've got this great idea for a book...I'll tell it to you and you can write it and we'll split the money," it's the most common off-the-wall comment I get. My own personal favorite (and one that I have used) is, "Were you born this rude, or do you have to work at it?" Of course, I interchange 'rude' with 'stupid', 'obnoxious', or whatever the occasion calls for. I've heard that question too but in my case the person making the query meant, "When are you going to write something that sells?" We can't all be Dan Brown or J.K.Rawlings. In my not even remotely humble opinion, good writing is literary fiction, even if it's also genre fiction. Elmore Leonard comes to mind. He writes crime, but he's no pulp hack. And look at Stephen Graham Jones. I really loved 'All The Beautiful Sinners,' a thriller that actually lit me up. So I seek out his earlier books and I find turgid, Pynchonesque, pretentious stuff that grew out of him achieving his PhD in creative writing. "Sure it's real...in this dimension!" "As real as those unicorns playing leapfrog over there." "Why,do you prefer an imaginary one?" Woohoo! Thank you Miss Snark! I (also) write books that will never be kept on syllabus-force-fed life support by any elbow-patched emeritus with light-bulb burn on the tip of his nose (from turning it up under one too many reading lamps). Thanks for a post that validates the working joes and janes who feel lucky just to be making a living writing. Because I don't have a dress for the Nobel Prize ceremony. I'm so tired of this "real book" thing, too. Though I do use a pen name to keep my writing and my academic career separate. Bloody arrogant buggers running around in the university buildings. My favorite kind of music is "beach" music. Give me a fun beat, foolish lyrics, get me dancing and giggling and kicking up my heels, and life is good. I think most people prefer "happy" music. Sure everyone likes to cry into their whiskey over a good blues tune now and then. But what really gets the crowds rocking? "Happy" music. Think about it. There's a reason why the Rolling Stones are rocking millions STILL. They never took themselves too serious. Happy music gets people dancing and giggling and kicking up their heels. It makes people forget all their troubles. It loosens up the ladies, gives the guys hope. "Serious" music reminds people that there are serious things to fret about and they start, well, getting serious. And what fun is that? So, I could never understand why whenever you go to a bar just when the crowd has filled the dance floor pumped up on a fun cover tune, the musicians play one of their originals - and it's always, always a serious song. Deeply concerned about this issue, I asked a musician friend of mine, "Why is it whenever musicians play their originals, they are always serious?" His response, "Because musicians want to be taken seriously." What does this have to do with literary fiction? Maybe all these people who wonder why the rest of us aren't writing literary fiction just want something they can take seriously. Never mind that it will remind them of all their troubles and cause them to drain their gin pails. Like serious musicians, serious book fans simply want to be taken seriously. "When are you going to take seriously what I write?" As an unabashed genre writer, I've always liked that story. I just fix 'em with my Eyes of Death and say frigidly, "I BEG your pardon." "When Are You Going to Write A "Real" Book?" I would write literary fiction, but like most successful authors, I prefer to be read than revered. I would write literary fiction, but I wasn't born rich. My books have to sell. I would write literary fiction, but really, who does anymore? I read this list to my husband, and he said his response would be, "Gee, don't you think Book Warehouse already has enough leftovers ?" OMG that is the funniest thing ever - anyone got a cloth to mop up the DC all over my keyboard?? When I was horticulturist for the city gardens, sometimes I'd get a wolf whistle. So I'd straighten up and holler, "You're ugly and I'm busy!" That line might be good for a pretentious jerk. Though what might be more effective is if you grab him in a headlock, give him a noogie, and discuss at length whatever happens to be on your mind at the moment. I don't have a clever reply to suggest. The writer of this letter might enjoy Simon Brett's novel, The Booker Book, in which the heroine battles writer's block in a valiant effort to produce her second literary novel. Her first novel had been critically acclaimed and she wants to be sure the second one matches the first. Each year, she revises Chapter I of the work-in-progress. Strangely enough, each new Chapter I bears a striking resemblance to that year's Booker Prize book. Our heroine has a friend who writes genre novels. This one works her way past the writer's block, publishes books on a regular basis, and lives on the royalties. Our heroine condescends to be her friend despite her low-class genre ways. A fabulous set of responses! My personal favorite is # 4. The whole question reminds me of the time I was interviewing a writer for a non-writing job at my company. She knew I was a writer, but had never bothered to find out what genre I wrote. She then proceeded to gush about how much she liked this former romance author--once the author stopped writing romance and started writing "real" books. As if I needed another reason to adore Miss Snark. Before I used, "Did you drop out of charm school, or did they actually ask you to leave?" Now I can add #3 and #8 to my arsenal. Thanks! LOL. I like the comebacks. An old creative writing teacher I had in a college class had that attitude. Had I known ahead of time I would not have taken it. I was already out of school, I was just taking a class for the heck of it. It was really hard to learn from someone that was so negative about what I love to read and write. In number 3 you incorrectly used "naval" as in maritime instead of navel as in umbilicus. Just thought I'd point it out since you snarkified that person for using "hock" as in ham instead of "hawk" as in offer for sale. I'm gazing at sailors as we speak. Can YOU see your navel?? and...why would you want to?? I should send this to my former creative writing professors who shunned genre fiction. Thank you. You are awesome. HOLY #$%@! You mean my books are fake! I'm not done making fun of real books. Why would I want to do something like that? Fakes are more fun. Do my books scare your books? Cause that is that plan all along. Cause I would rather have the money now, than have my estate get it when I'm dead. Real books cure insomnia. Mine cause it. I would rather use my time more efficiently, like writing books that sell. I like being able to pay my bills. That is all that I can come up with... Feel free to use. Brilliant! Thank you, now I'll have to wipe tea off my monitor. "What, instead of the "imaginary" books that make my bank account happy?" Hey! My comment got zapped! Do you need bats in your belfry? Welcome back to the Blogosphere Miss B! 23 Skidooobie doobie doooo you know what I mean?